Mondulkiri is Cambodia’s largest and also its most thinly populated eastern frontier province with only 40,000 inhabitants made mainly of hill tribes. The largest ethnic minority among them are the Phnong who live off the land, still practicing shifting cultivation (slash and burn). They plant rice, fruit trees, coffee, rubber and cashew nuts and hunt wild animals. - Although more and more houses are built in 'Khmer style', you can still find the traditional Phnong houses. In the houses there are big jars and traditional gongs. 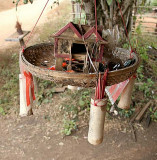 Jars and gongs are among the most valuable possessions of the ethnic minorities in Cambodia, both in traditional and spiritual as well as material terms. The Phnong are believed to date back 2,000 years and are deeply animistic, believing that all things, animate and inanimate, have spirits. Therefore you can find magic poles in front of nearly every house, at every well and in the paddy fields that shall invite good spirits to protect the people, care for good luck and a good harvest and shall ward off evil spirits. Because the Phnongs believe in the power of the spirits they still sacrifice animals, either to appease angry spirits or to thank benevolent spirits for helping them (e.g. curing them from an illness or providing a good harvest.) 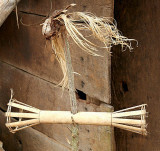 The poles have got a decoration of bamboo fibres that have been dyed (formerly with blood, nowadays with red paint, because it lasts longer), a small slit drum to call the spirits, a small elephant head which symbolizes strength and can thus protect the people and their possessions and a small kind of basket, similar to the ones that are used for offerings. 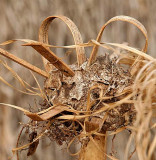 These are normally more or less the same items that can be found at houses and fields. At wells there are often small water buffaloes instead of elephant heads. Sometimes the poles can also have additional items as e.g. a small house. One of the last Phnong ladies with brass anklets on her legs. 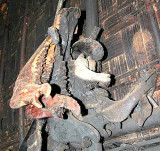 The Red Khmer forbade and destroyed these traditional rings.